Croatian rock star Marko Perkovic 'Thompson' has just begun a US-Canadian tour, with two concerts in New York (Nov. 2 and 3), followed by concerts in Toronto (Nov. 4, reportedly cancelled), Cleveland (Nov. 9), Chicago (Nov. 10), Los Angeles (Nov. 11), Vancouver (Nov. 16), and San Francisco (Nov. 18.) Full details are in footnote . Emperor's Clothes has proven that Thompson is a self-declared Ustasha - a Croatian clerical-fascist. (Clerical-fascist ideology indoctrinates with a mixture of Nazi-type racism and Catholic religious fanaticism.) The Ustasha movement murdered over a million people from 1941-1945. The overwhelming majority were Serbs (Slavs who are Orthodox Christian, i.e., non-Catholic), but they also killed most Jews and Roma ('Gypsies') in the greater Croatia that they ruled. It is chilling that one can find videos on Youtube, such as the one below, in which people at Thompson's June 2007 concert in Zagreb, Croatia, are heard chanting "Ubij, Ubij, Ubij Srbina." It means "Kill, kill, kill a Serb." [Note added, 2018: the 2007 video is no longer working, however, unfortunately, there are still mass chnats of Ubij, Ubij, Ubij, Srbina at Thompson concerts, such as the example provided below, shown in a newcast about Thompson's 2015 concert in Knin, during the government organized celebration of the genocide against the Serbians of the Krajina. 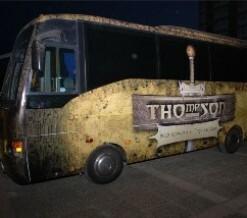 This tour by Thompson's band, also called 'Thompson' (after the Thompson submachine gun), has produced justified outrage. It is an attempt to legitimize clerical-fascism. If Thompson - whose politics would logically lead to the murder of millions of North Americans, including African-Americans and other so-called 'non-whites,' Jews, people of Serbian descent and others of the Orthodox Christian faith, progressives, and anyone (teachers? trade unionists?) who dared to resist the clerical-fascists - if Thompson can carry out this tour successfully, it will be a victory for fascism. It is crucial that in opposing the tour, we explain the politics of clerical-fascism to the broadest possible audience. Those politics cannot survive scrutiny; in the end, they cannot survive without the use of terror. Unfortunately, among those organizing opposition to the tour, there is much unclarity about the issues. "One of those songs - titled Jasanovic/Stara Gardinska [Correction; Jasenovac i Gradiška Stara. - J.I. 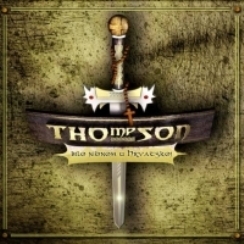 ], which Thompson sang live in Croatia in 2002 - venerated those two infamous concentration camps where at least 90,000 Serbs, Jews, Gypsies and anti-fascist Croatians were murdered by the Ustashe movement and its Nazi collaborators during World War II." We are in Wiesenthal's long-term, today. I charge that clerical-fascism now controls Croatia; that it is spreading, sponsored by Germany, the U.S., and the leadership of the Catholic Church. Why have the US and Canadian governments granted him visas? 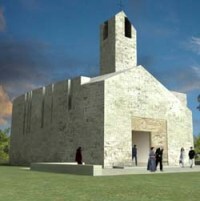 The Thompson home page features images of the St. Benedict's medal, most devout of Catholic medallions, which Thompson wears at concerts, and of a Catholic church that Thompson is raising money to build. 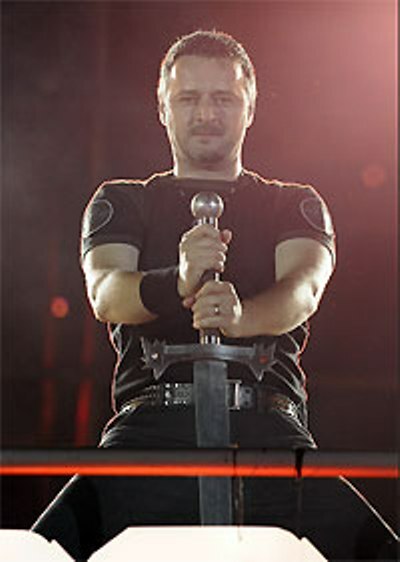 The Crusader's sword forms a military cruciform, symbol of religious war. 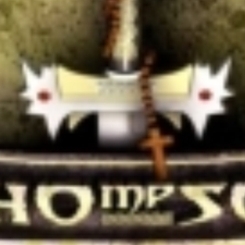 Just to make sure people know that his trademark sword is a religious symbol, not some dungeons and dragons-type iconography, on album covers Thompson adorns it with a rosary and cross, colored red to remind Catholics of "our savior's blood." 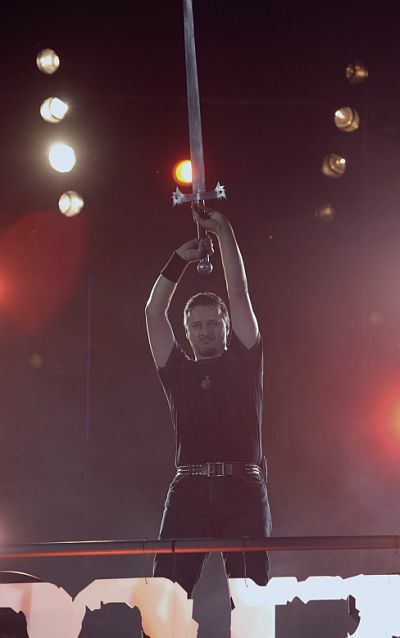 ...why, given Thompson's public self-definition as singer-prophet of the church militant, has the Catholic hierarchy not condemned his clerical-fascism and prohibited Catholics from attending his concerts? Why, instead, has the Croatian Catholic church sponsored him and championed him politically? Those organizing opposition to Thompson scrupulously avoid mentioning the role of the Catholic church. But the fact that the Catholic hierarchy promotes Thompson raises a basic question: to what extent is that hierarchy promoting clerical-fascist ideas among the vast Catholic population, worldwide? Who is teaching these children? "in which the Catholic Church has a full opportunity to work in the spirit of its principles and to the benefit of the people within which it lives." "In the spirit of its principles and to the benefit of the people in which it lives." The late Mr. Tudjman was a clerical-fascist; therefore, clerical-fascism determined his notion of "benefit." However, regarding the specific question of the influence of the Catholic church, and not just in Croatia, he was speaking accurately. Since the Catholic church aggressively champions Thompson in public, the question is: what are they teaching children in the former Socialist states, and elsewhere, in private? To return to the matter of Mr. Adler's erasure of 90% of the Jasenovac victims, perhaps he was misinformed. Perhaps by the New York Times. Some of the fans were wearing the black caps of Croatia's infamous Nazi puppet Ustashe government, which was responsible for sending tens of thousands of Serbs, Gypsies and Jews to their deaths in concentration camps." There are two important falsehoods in the excerpt above. One has to do with the concert, the other with Croatian death camps. 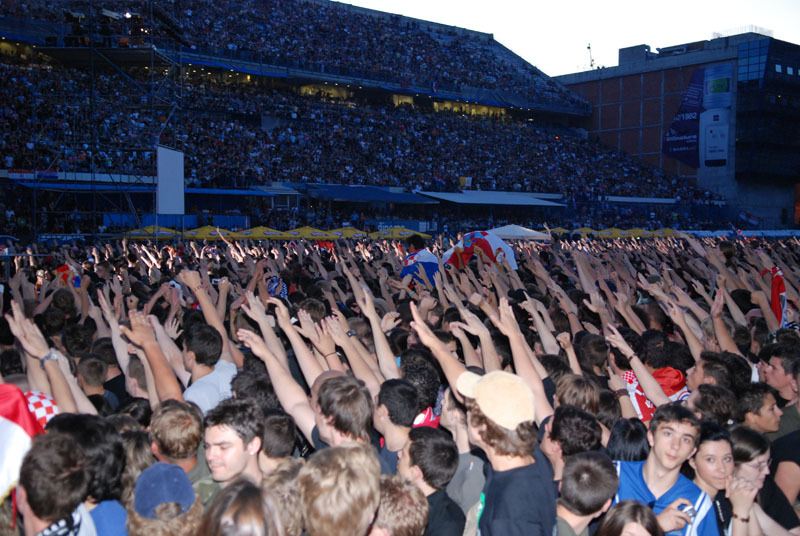 First, regarding Thompson's Maksimir stadium concert, it isn't true that "thousands" of fans gave the Nazi salute. It was tens of thousands. 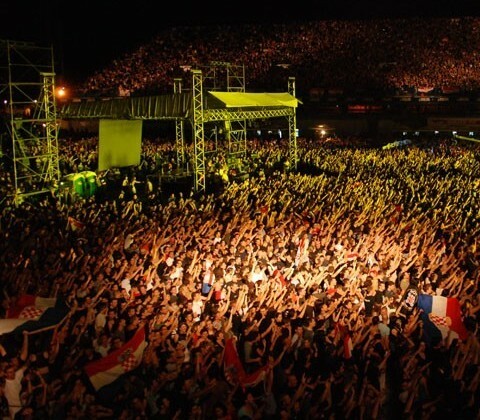 According to local news estimates, 50-60,000 people packed into the stadium. They were listening to music, but they were also expressing their clerical-fascist beliefs. 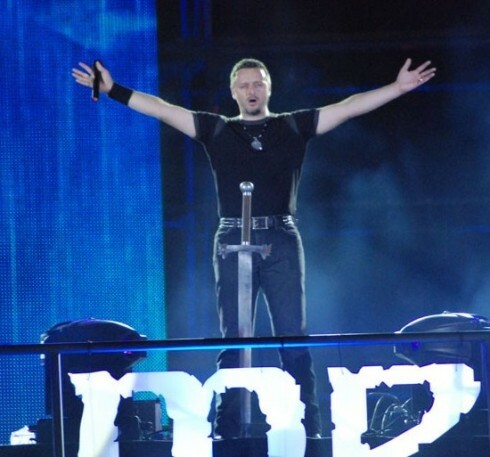 In the photo above, taken at Thompson's June concert in the Maksimir stadium in Zagreb, the boy wears a t-shirt displaying Thompson's trademark Crusader's sword (also seen on the concert tour bus) and the Ustasha slogan "za dom spremni" ('for home, ready'). What's on the back of the shirt? On the back of the shirt, the words 'Crna Legija,' or 'Black Legion,' the infamous Croatian SS military force that massacred hundreds of thousands of Serbs and other so-called "foreign elements," wiping out entire villages. In the song Jasenovac i Gradiška Stara, which Thompson admitted singing from the early 1990s until 2002, he boasted that the 'Black Legion' had returned. The 'U' on the shirt stands for Hitler's beloved Ustasha. The checkerboard motif in the center is from the Ustasha flag; it was resurrected along with the Croatian Ustashe, who have been back in power since 1990. A Hitler salute and, on the upper right of the banner, a 'U' for 'Ustasha.' And everyone wears Thompson shirts. The women are wearing Ustasha caps. ...and they are organized. Including the children. The people in the picture above are giving the Nazi salute in response to Thompson's chanting of what Mr. Wood called "a well-known slogan from World War II." The slogan, Za Dom Spremni ("For Home, Ready"), was the favorite of Croatia's clerical-fascist rulers. It meant: Ready to do anything to 'purify' Croatia from "foreign elements." Serbs, Roma and Jews. Za dom spremni - For Home, Ready! The Order of the 'Iron Trefoil,' the military medal of Hitler's favorites, the Croatian Ustashe. 10-IV-1941 (April 10, 1941) was the day on which the Nazi forces invading Yugoslavia reached Zagreb and installed the Ustashe as the clerical-fascist rulers of greater Croatia. It is tragic but true that Croats have been indoctrinated to view this as a great victory by and for Croats. Not having access to the pictures and videos above, most Times readers would have no way of knowing that Nicholas Wood minimized the number of people giving the Nazi salute, reporting that there were thousands when in fact there were tens of thousands. Was he trying to soften the horror? One wouldn't think so; after all, he talks about "Croatia's infamous Nazi puppet Ustashe government," which makes him sound like an anti-fascist. - Wood was erasing most of the victims. How could readers know that, prior to Croatia's 1991 secession from Yugoslavia, the New York Times had reported that the Ustashe murdered 800,000 people at the Jasenovac death camp? A recruiting poster for the Croatian Ustasha SS force, known as the 'Black Legion.' Ustasha ideology was fanatically Catholic and targeted "foreign elements," but the Ustashe defined local Muslims as 'Croats,' and worked closely with Muslim extremists. This poster, aimed partly at Muslims, shows one soldier wearing a fez, the hat of fanatical Islam, and includes a minaret (part of a mosque) in the background. The caption reads: "Great leaders Adolf Hitler and poglavnik [fuehrer] Dr. Ante Pavelic call you to defend your homes. 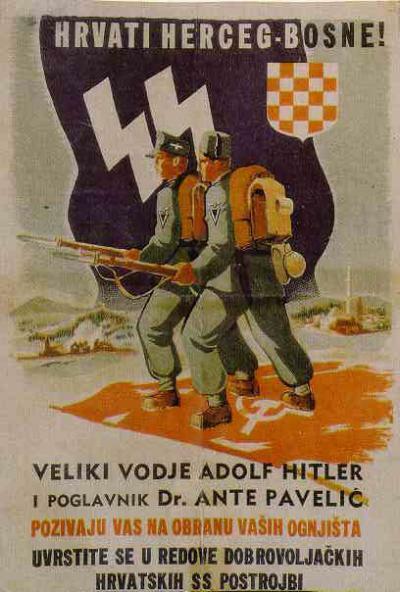 Join volunteer units of Croatian SS." From "800,000" to "tens of thousands" of Holocaust victims. And this not in a recognized revisionist rag, but in the New York Times. The Times routinely publishes corrections of errors. If the 800,000 figure had been an error, the editors would have published a correction, explaining the reason for the change. They did not. They never presented any justification for their 90% cut. They simply erased the old figure and brought in the new, telling readers nothing, repeatedly publishing their 90% cut, from 1991 to the present. An act of monumental duplicity? Yes. B) Signaling other media worldwide to follow their lead in suppressing the important historical information that a) the Serbs had played a crucial role in the fight against fascism and b) the Serbs, along with Jews, Russians, and Roma/Sinti, had suffered the greatest losses from the Nazis and their allies (in the Serbs' case, the Croatian Ustashe), precisely in punishment for Serbian opposition to fascism. By keeping this historical perspective from ordinary people, the media could prevent them from becoming suspicious of propaganda that portrayed Croatian secessionists using Ustasha symbols and chanting fascist slogans, as victims of genocide; Serbs expressing quite legitimate fear of returned Ustasha power, as 'new Nazis'; and Yugoslavia, created to defend the Balkans against outside pressure (meaning, historically, Germany and the Vatican), as the cause of strife in that region. By surreptitiously and massively revising what had happened in World War II, the Times was, in Simon Wiesenthal's words, "building a way for a new Ustashe." I have made a most serious charge. Let me present the proof. When we put a Youtube video on Emperor's Clothes - a process called 'embedding' - we also download a copy of that video and save it. If one of our 'embedded' Youtube videos is removed from Youtube, then and only then we will upload our copy to our own server and provide readers with a link. How will we get that link to our readers? We will put it on a page dedicated to links to embedded Youtube videos that no longer work on Youtube. That page will be www.tenc.net/a/yt.htm Right now (Nov. 2, 2007) there is nothing on that page because (knock on wood) all our embedded videos are working, so if you go to that page today, you will find a friendly greeting and nothing else. If you cannot access one of our embedded Youtube videos, try going to the Youtube link we provide under every embedded video.If you get a message "this video has been removed" then try our removed-videos page www.tenc.net/a/yt.htm If the video you want is not there, it means we don't yet know the video was removed from Youtube. Please write us and we will upload it as quickly as possible. Sorry this is complicated; we are just trying to be helpful, which always gets one in trouble. Trying to create an appearance of balance in an article that was otherwise a glorification of Croatian secessionist leader Franjo Tudjman, the Washington Post solicited a dissenting opinion from the late Simon Wiesenthal. "'Like the deniers [of the Holocaust], he reduced the number of victims,' said Simon Wiesenthal, the well-known Nazi hunter, in a telephone interview. Wiesenthal said his research suggests 'a few hundred thousand were murdered' in Jasenovac alone during World War II. To Wiesenthal, the real danger in Tudjman's work is not the specific numbers 'but the diminution of the problem. ... The long-term danger is that he is building a way for a new [fascist] Ustashe.'" Notice that as quoted, Wiesenthal says "'a few hundred thousand were murdered' in Jasenovac alone." Two points about this. "There is still dispute over the total number of those who died in Jasenovac camp. The Simon Wiesenthal Documentation center in Vienna, which researches Nazi war crimes, believes the figure is 500,000." Second, the Post paraphrases Wiesenthal saying he was talking about "Jasenovac alone." That is because Croatia had a death camp called 'Jasenovac,' which in turn was part of a complex of camps also called 'Jasenovac,' and then there were death camps outside this Jasenovac complex. It appears that Wiesenthal was speaking only of the individual site called 'Jasenovac,' meaning that in his estimate, the number of people murdered in all Croatian death camps together was greater than 500,000, and probably far greater. Wiesenthal issued his warning that cutting the number of Jasenovac victims meant "building a way for a new Ustashe" some two years before Croatia's murderous eviction of almost the entire Serbian population of the Krajina region in 1995. 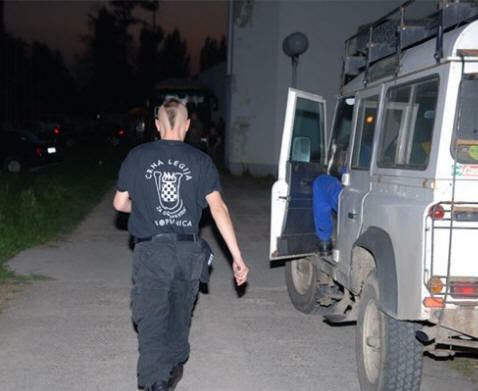 This eviction put Tudjman and his associates in control of a virtually serbenrein greater Croatia, including Croatia proper, Dalmatia and Krajina. Smaller than the World War II 'Independent' State of Croatia only in that it did not include Bosnia-Herzegovina. In 2003, the Croatian parliament passed a law under which members of a Program Council in control of Croatian Radio-Television, HRT, were henceforth chosen by parliamentary vote. "Silobrcic believes that the new law on HRT, which becomes effective next week, foresees a new way of electing members to the council according to which party policy directly participates in the election." Since that time HRT has been subject to extreme pressure, including suspensions, threats to fire and firing of leading people for permitting some investigative reporting and weak criticisms of anti-Serb racism, with even threats of violence condoned by top government officials. This is the 'independent' station that broadcast Thompson's June 17 Maksimir stadium concert on July 2, 2007.